in selected Countries of SEA. In this section of our look into national liability laws published right in time for the Durban summit we focus on liability laws in Asia, Southeast Asia, and Australia. The book we are discussing is “Climate Change Liability – Transnational Law and Practice”, edited by Richard Lord, Silke Goldberg, Lavanya Rajamani and Jutta Brunée, Cambridge University Press, Cambridge 2012, ISBN 978-1-107-67366-3. To our knowledge, this is the first book comparing the law of different national systems under the aspect of climate change liability, the major topic of this blog. It has been written by more than 40 authors and is of good average quality. We present here a very detailed summary of the book. When doing so, we focus on one of the two types of liability: private liability (discarding public or common liability). The summery of the various contributions focuses on clearly comparing and stating the chances for victims of climate change to successfully sue polluters. For some of the countries examined in the book, our summary is very short, regardless of the length of the original text. The first blog entry focused on the general conclusions the authors draw from the detailed investigation. 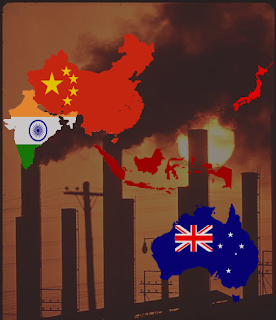 This second blog entry presented here summarizes the chapters on Australia, China, India, Indonesia and Japan. Private climate damage litigation is unlikely to be successful in Australia (85, 102). The authors examine two potential paths: negligence and nuisance. Case law on nuisance can hardly be applied to climate change compensation claims given that it has been developed for "small-scale local disputes" (99) and given that greenhouse gas (GHG) emissions will hardly be seen as "unreasonable" (99). Case law on negligence gives no better prospects. Negligence is given “where a defendant has breached a duty of care owed to a plaintiff, thereby causing harm to the plaintiff” (86). The duty of care concept remains pretty vague, courts requiring foreseeability and further, not well established elements to be given (86, 87). Courts are likely to deny both foreseeability of the concrete harm (88-90). Furthermore, a “definite contribution to a process resulting from the cumulative effect of a multitude of such contributions” is not necessarily regarded as legal cause, even if negligence there was to be assumed (97). As for Claimants, there may be a lot of victims of climate change from the region, for instance those affected by the Queensland Floods in November 2010 - February 2011 with Australian government disaster recovery payment reaching nearly $500 million Australian Dollars. However Australia is also not attractive for climate-change victims in so far a proportionate liability regime applies (100); thus there is no joint and common liability. In addition to the usual causation issue, the author sees no chance for successful climate damage compensation claims in China under tort law because there is no law restricting the emission of GHG. Such a law would be a precondition for the successful application of the law on legal liability for environmental torts (136, 137). This statement contrasts with some earlier paragraphs on environmental tort principles being applicable to GHG emissions, these principles being quite friendly to the victims of negative environmental actions (135, 136). Regardless of this slight discrepancies, as courts are not independent in China, civil liability, at the end of the day, will only be recognized if the ruling party so wishes (which is unlikely to happen). A special court for environmental affairs is also in charge of civil matters, the National Green Tribunal (157). The Tribunal “is required to apply the principles of sustainable development, precaution and polluter pays” (157) which is advantageous for climate change victims. Referring to the Massachusetts v. EPA case, the authors take the view that GHG might fall under the Air (Prevention and Control of Pollution) Act of 1981 (159). The Supreme Court is likely to be influenced by the strong Indian human/fundamental rights doctrine (149). Nuisance: The authors take the view that the common law principle of “nuisance” provides “some (limited) hope to climate litigations” (165). Contrary to other common law systems so far examined on this blog, “nuisance” does not necessarily require a vicinity relationship; it may also be given if an act or an omission “must necessarily cause injury, obstruction, danger or annoyance to persons who may have occasion to use any public right” (165). Negligence: Negligence has as a precondition that “the defendant owes a duty of care. This requires the plaintiff to demonstrate foreseeability of the damage, a sufficiently proximate relationship between the parties, and that it is just and reasonable to impose such a duty” (168). Furthermore, there must have been a damage caused by the negligent act, but an increase of the risk or a contribution amongst other contributions may be sufficient (168, 169). Absolute liability: The authors present absolute liability as an independent legal base from nuisance and negligence. Without providing an assessment on the chances for success, they refer to a landmark decision of 1987 the Supreme Court established the rule a kind of “absolute liability” for a company engaging in a hazardous or inherently dangerous activity (166). In another ruling of 1996 the Supreme Court established the principle of “the polluter pays” (167). Comment: Please note that, in other jurisdictions, GHG emissions are rather not seen as hazardous or inherently dangerous. Unlawful action might include actions that contravene subjective rights of others, legal obligations, public decency or principles of appropriateness, prudence and reasonable care (194). The authors make no clear statement whether industry's emissions of GHG as such might trigger civil liability. However, they assume liability of private businesses if the businesses committed an unlawful action, e.g. by exerting an activity without a license or breaching a license (201). A compensation claim is not hindered by the fact that the license as such (or the law providing for such a license) has nothing to do with climate change (201). Indonesia disposes of a class action mechanism (196, 197). Article 709 of the Japanese Civil Code provides: “A person who intentionally or negligently violates the rights of others shall be liable for the loss caused by the act.” There are two interpretations of “negligently”: “The first interpretation is that if a person can foresee the occurrence of the damage, he/she is liable. The second interpretation is that if a person can avoid foreseeable damage, but does not do so, he/she is liable.” Courts prefer the second interpretation (228). As in other jurisdictions, the burden of proof lies on the alleged victim, but courts sometimes try to mitigate by recognizing indirect evidence or epidemiologic evidence (229). Sometimes the compensation is discounted due to the limited likelihood of causation (230). The emission of GHG by the specific defendant must have been causal for the damage, not just all GHG emissions collectively (231). Some of the approaches, with regard to the principle of joint and common / several liability, might help to overcome this difficulty, says the author (231). Pointing to the multitude of factors impacting climate (thus not just climate change), the author concludes on a rather skeptical note: “Therefore, it is practically difficult, if not impossible, to single out a portion of damage directly attributable to climate change and to prove a causal link between the act of emission and the damage caused by it” (231, 232).